Observation - Karoo Prinia Nest - Southern Africa. Description: In Erica, cannot figure out what the nesting material is, it seems to be lined with Tachonanthus fluff, but the rest? 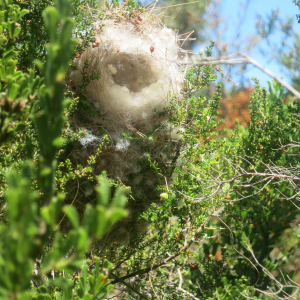 In Erica, cannot figure out what the nesting material is, it seems to be lined with Tachonanthus fluff, but the rest?